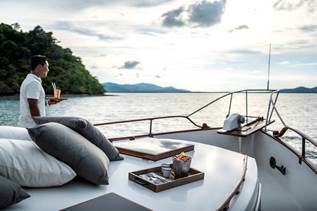 COMO Point Yamu – a contemporary oceanside resort perched above the Andaman Sea in Phuket – is excited to launch the new ‘Phang Nga Bay Experience’, which includes a seven-night stay in one of the resort’s iconic villas, as well as a private Champagne cruise taking guests to the heart of the dramatic Phang Nga landscape. Phang Nga Bay is one of Thailand’s most prized national parks, located between southern Thailand’s mainland and the island of Phuket — 20 minutes from COMO Point Yamu by private transfer. 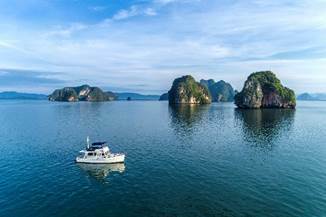 With this new experience, guests will step into the resort’s Capricorn II yacht and sail away on a four-hour cruise exploring the bay’s striking limestone cliffs and rock formations that jut out of the turquoise waters. 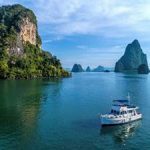 The cruise will also take in the 40 small islands that sprinkle the bay, each cloaked in forest and dotted with mysterious sea caves and hidden lagoons. Among these islands is Koh Tapu, or ‘James Bond Island’, so called after appearing as the island hideout of the villain Scaramanga in the Bond film, The Man with the Golden Gun. Guests can explore this iconic setting, best viewed as the sun descends over the Andaman Sea. Back at the Paola Navone-designed resort, guests will spend seven nights in one of COMO Point Yamu’s three top villas, each with spectacular ocean views. The three-bedroom Andaman Pool Villa features an enormous infinity pool, with spacious indoor and outdoor dining areas and a kitchen; the Point Yamu Pool Villa is set across two floors, with two king bedrooms and a twin; and the COMO Pool Villa has four bedrooms, with a large ocean-facing infinity pool. Each stay will also include personal butler service and daily personalised villa breakfasts, as well as opportunities for relaxation and wellness at the resort’s nurturing COMO Shambhala Retreat. The Phang Nga Experience is available from November 1st 2018 to October 31st 2019. The experience is priced at THB 324,800 (approx. AUD 13,614) for seven nights in an Andaman Pool Villa, THB 367,500 (approx. AUD 15,404) in a Point Yamu Villa and THB 437,500 (approx. AUD 18,337) in a COMO Pool Villa. Please note: prices may fluctuate in high season.